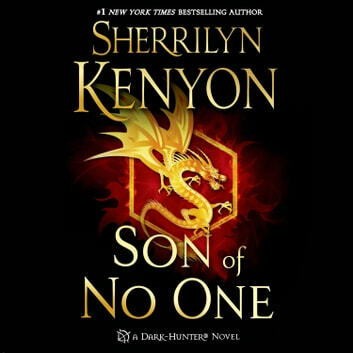 In Son of No One, next in the blockbuster The Dark-Hunters series by Sherrilyn Kenyon, it's not easy being life's own personal joke, but Josette Landry has made an unstable peace with the beast. Completely down on her luck, Josette takes a job with a local paranormal group as a photographer and camerawoman. Yeah, they're even crazier than she is. The only paranormal thing she believes in is the miracle that keeps her rusted-out hoopty running. But when something truly evil is released into the world, they are forced to call in reinforcements. From the moment Josette meets Cadegan, she knows something about him isn't quite right. 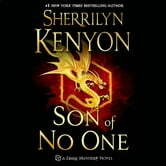 Mysterious and armed with lethal sarcasm, he seems a lot older than his age. Centuries ago, Cadegan was viciously betrayed by the only person he'd ever trusted and was cast into an immortal prison. Forced against his will to do good, he hates everything in life. All he wants is a way out. But for the damned there is only eternal suffering. And yet there is something about Josette that intrigues him. Something he can't seem to fight and the last time he felt this way about a woman, it cost him everything.